Ok, this is not our typical Business post – but I wanted to put this across for all the techie readers and online fanatics out there. Reddit, a competitor to Digg has been what it is since the time I have know it. The look and feels still remains the same what it was even couple of years back. No Change. Here comes the interesting part – I have never seem so much correlation between competing sites. Have a look at the graph below and you will know for yourself what I am talking about. If you see the graph above Digg traffic is exactly inversely proportional to Reddit traffic. 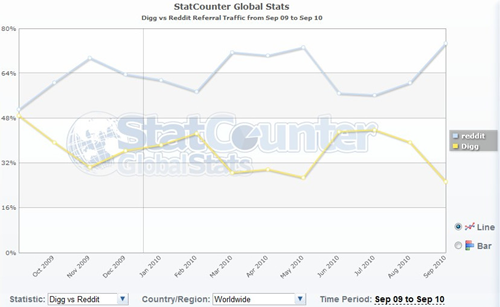 The amount of traffic which Digg lost, is the exact amount gained by Reddit – And this trend has been there for over an year. Now, I do have a small doubt on whether the graph has been charted correctly – because such exact correlation is really surprising. Its in percentages so the correlation MUST be that way. How can you not understand? If your question is that if Indians use any Indian bookmarking site, I would like to say that the overall understanding and usage of social bookmarking by Indians is very less. The SEOs of India mainly think that its just another backlinking option…….hotklix by times of india group is a clone but it is misused by all masala blog owners…..no wonder you would hardly find any good article there or good subscriber list…. The graphs should be like this only. Actually its comparing stats for only two entities – Digg and Reddit and the values are relative in percentage. So for each date, the sum of Digg percent and reddit percent must be 100%. If Digg is 30%, Reddit must be 100-30 = 70%. No doubt, we are seeing the graphs in perfect correlation and mirror images to each other. Aryan is correct. You’d have to be, let’s say, mentally challenged to not see why there’s a perfectly inverse relationship between the two. The only traffic represented here is Digg and Reddit. These are not raw numbers, these are percentages. In other words, it’s always going to equal 100%. If the graph said digg had 41% and reddit had 46%, you’d be missing 13%. By the definition of percentage, every time Digg goes down 1% of total, Reddit has to go up 1% of total. If this graph were considering other sites besides these two, it might be a different story, but as it is, with just the two of them, the relationship will always be exactly inversely proportional. Digg lost and others gain but this is unreal.. looks more like Statscounter bug to me. Digg lost it’s sheen after the last v4 upgrade. That upgrade was below everyone’s expectations. Not related to this post but just wondering is anybody uses Indian social bookmarking sites and what’s the most useful/ popular one? Since Diggers are migaring to Reddit, I think Reddit (long known for its intelligent, mature userbase) is about to circle the drain. I was on Digg for a while and it had one of the most childish, most cruel, most useless site members I’ve ever seen. Even 4chan users can boast they do some good (e.g. tracking animal abusers). So sorry to see Reddit turn to crap. The perfect correlation is frankly, creepy! Though I wonder if the user base for the link-sharing sites hasn’t expanded at all?